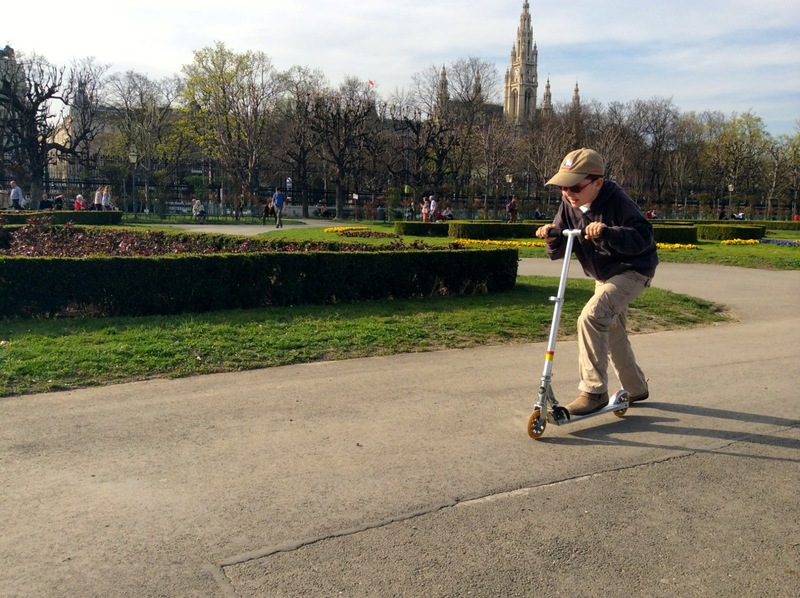 Vienna aims to increase sustainable transportation’s share to 80% by 2025. By Darren Davis and Andreas Lindinger. The city of Vienna has just adopted its latest 10-year city development plan, known as STEP 2025. 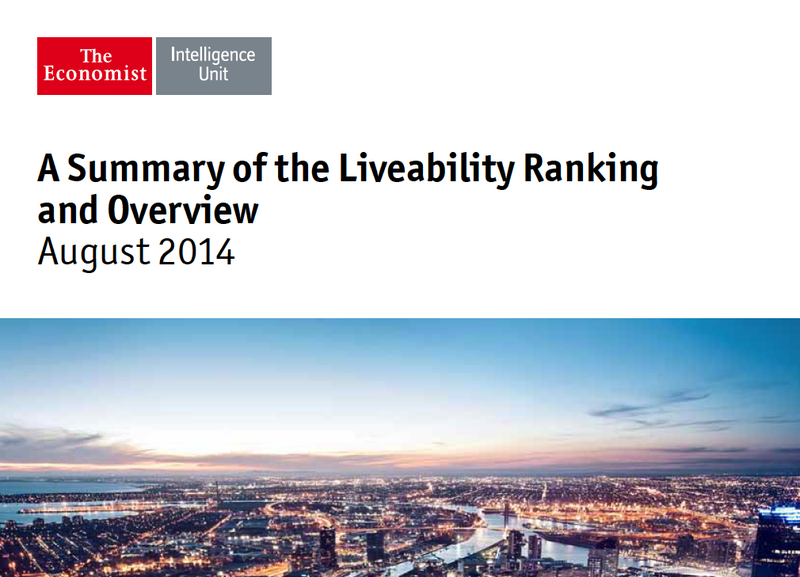 Key from a transport point of view is the goal to reduce the already very low proportion of 27% of all trips by car down to just 20% by 2025 as a part of a comprehensive plan to further increase Vienna’s already well-admired high degree of liveability. Vienna is facing strong growth because, since the fall of communism, it is strategically located as a central European bridge between western and eastern Europe. 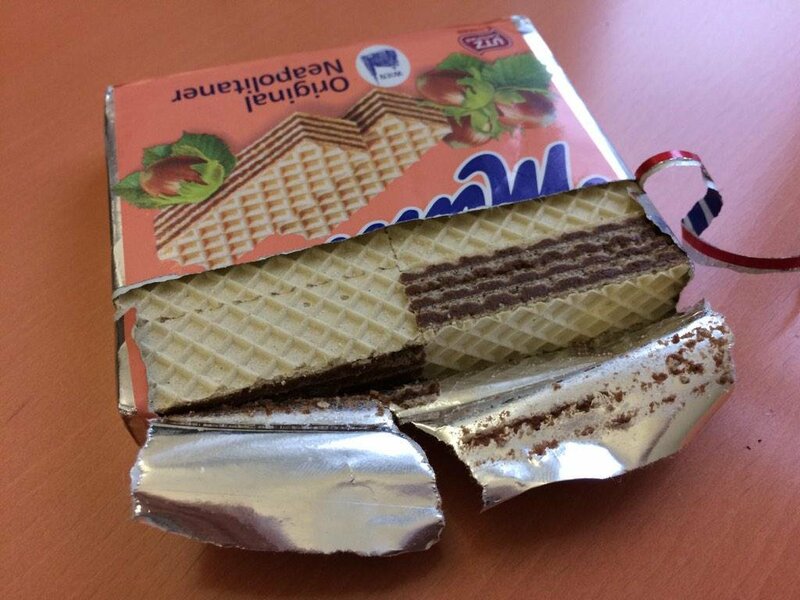 This, and the eastward expansion of the EU, is making Vienna an even more attractive city for immigrants. After a long period of stagnation, Vienna’s population has started to grow strongly again and this looks set to continue indefinitely into the future, and is projected to reach 1,964,307 people by 2025, up from 1,741,000 in 2013. Today, Vienna is the fastest-growing German-speaking city. This population growth means that the STEP 2025 goal to reduce car trips from 27% to 20% of all trips is all the more challenging as significant growth is required in the Umweltverbund (sustainable modes) just to keep pace with growth, let alone contribute to the improved mode share target. Given Vienna’s projected growth, the number of car trips in the city would increase by 12% if car mode share stayed the same. While on the face of it, unitary governance, with Vienna being both a city and an Austrian state, should make implementation of changes easier, the considerable autonomy given to the 23 Bezirke (districts) within Vienna means that local issues and concerns can and do override city-wide priorities, for example when it comes to parking regulations. Moreover, a third of the population of the Vienna conurbation (Ballungsraum Wien) lives outside of Vienna in the states of Niederösterreich (Lower Austria) and Burgenland, which makes it necessary for Vienna to cooperate with these states on transportation issues. While Vienna achieves a highly impressive non-car mode share for all trip-making of 73%, the reverse is almost exactly mirrored in the parts of the conurbation outside of Vienna, with 79% of trips in these areas being by car. This mismatch is also reflected in the public transport ridership figures of the Verkehrsverbund Ost-Region (VOR), the public transport co-ordinating authority for Vienna and the surrounding states of Niederösterreich (Lower Austria) and Burgenland. Of the 1,056,993,873 public transport trips in the conurbation in 2012, fully 916,452,1981(or 86.7%) of all of these trips took place in Vienna, even though Vienna only makes up 67% of the population of the conurbation. Of note is that the bulk of the trips outside Vienna are the 82,508,846 trips on S-Bahn Wien (the commuter rail system), most of which have either an origin or destination in Vienna. The fact that there are large commuter inflows from these areas into Vienna, due to Vienna’s extensive zone of influence and the sheer number of job and study opportunities, is reflected in very heavy traffic congestion on the motorway system, most notably the A23 Südosttangente. This traffic then enters Vienna through major access routes (Ausfallstraßen) such as Triester Straße, Prager Straße and Brünner Straße leading to the Gürtel or second ring road. The effect of all of this traffic has been two-fold: The volume of traffic has compromised the quality of the environment through noise and pollution impacts while the built form has reacted to the volume of traffic by becoming more car-oriented. 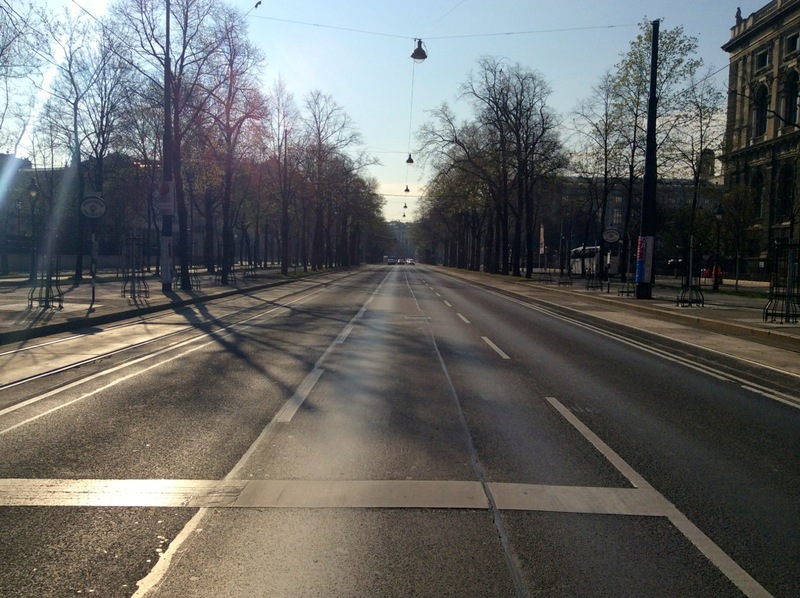 Initiatives to free Vienna’s Ringstraße from cars (at least on Sundays) or to dedicate one lane to cyclists (due to current conflicts between cyclists and pedestrians because of bad infrastructure) haven’t been successful so far. The risk here is that even if Vienna succeeds in meeting its mode share targets, the freed up capacity on the higher-order road network will simply be taken up by more commuters from suburban areas. This means that agreed metropolitan-wide solutions are required to ensure that the transport problems of suburban areas are not simply transferred into Vienna, making their problems an issue for Vienna to resolve. Elements of this are in place with S-Bahn Wien (commuter railway) carrying 300,000 passengers per day with an emphasis on park and ride lots at suburban stations so that commuters do not need to drive into Vienna at all. Some improvements are taking place such as upgrades to key stations, more frequent service and some line extensions. The opportunity to extend the S-Bahn network to Bratislava, the capital of Slovakia just 65km from Vienna, was lost when the Austrian Railways sold a key section of line to private interests. However, more wide-ranging integrated sustainable transport solutions are required across the conurbation. STEP 2025 has plans for a more urban feel to the built environment on heavily-trafficked roads with plans to reallocate space to sustainable modes and to improve the street environment. As just under two-thirds of road space is taken up by cars for driving or parking, Vienna aims to dedicate more street space to walking, cycling and public transit and transform streets to become more attractive places. Measures include the increased use of 30 km/h zones and shared spaces to calm traffic, especially in residential areas. However, as is common everywhere, there are substantial challenges around achieving road space reallocations. Cars parking and driving still use 65% of Vienna’s street space. Changes in Austrian law in 2013 allowed for the creation of shared zones with a 20 km/h speed environment with all road users – including pedestrians and cyclists – having the same priority. 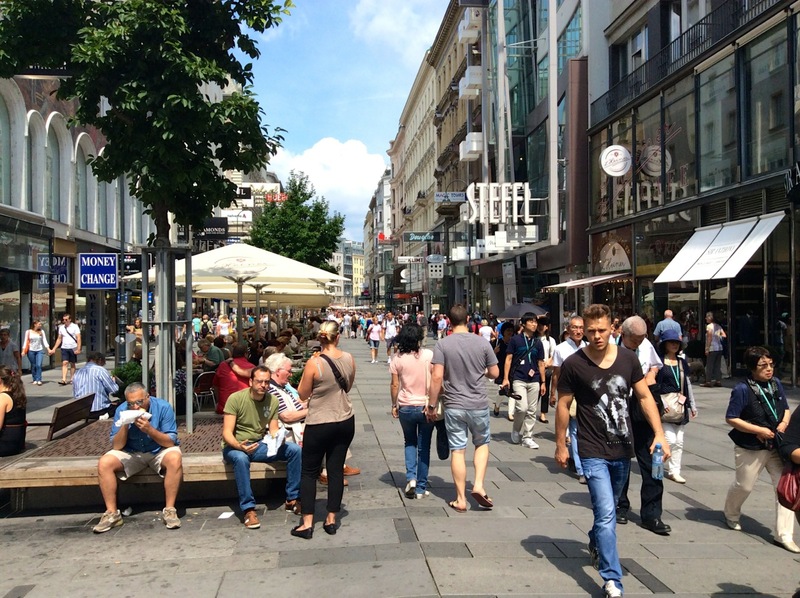 Such a shared environment was trialled in Mariahilfer Straße, one of Vienna’s premier retail streets. Even though it was clearly a major improvement over the previously car-dominated environment, a referendum in the adjacent districts on it becoming permanent only narrowly passed. 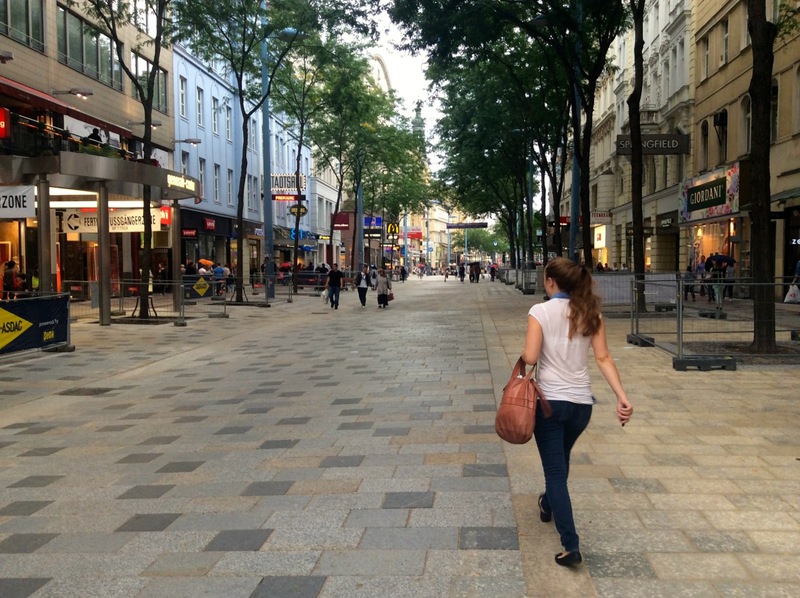 Mariahilferstraße is being transformed into a street with pedestrian and shared space areas. 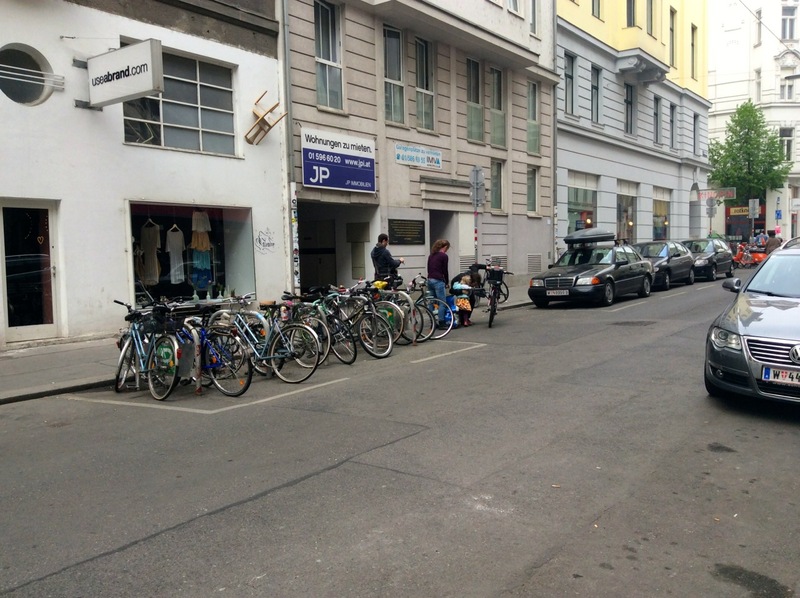 Parking remains a major challenge and a contentious issue in Vienna. The Stellplatzregulativ requires a minimum amount of parking to be provided in new developments, although this ratio can be reduced in areas with good access to higher order public transport. A perverse effect of this can be on small-scale developments where the minimum parking requirements can make the development either economically unfeasible or that the parking requirement itself makes it impossible to carry out the development in a way that is friendly to the existing built form. STEP 2025 proposes an exemption from minimum parking requirements for such small-scale developments but there doesn’t seem to be any overall plan to get rid of parking minimums. However, the recent amendment of Vienna’s building code (Bauordnung) lowered parking requirements from one parking space per apartment to one parking space per 100 m2 apartment size, which should decrease the overall number of parking spaces required given the increased demand for smaller apartments. Another unusual approach in Vienna is the Garagenprogram where the public sector subsidises common parking facilities in areas of high parking demand. The rationale is to use this as a lever to reduce surface parking and reallocate space to sustainable modes. In areas outside the Gürtel (the second ring road), the requirement is only to eliminate one parking space for every three spaces provided by the Garagenprogram. In addition, the compensating parking removal doesn’t need to take for five to seven years after the construction of the parking facility. And in high parking demand areas, this parking reallocation can be elsewhere in same community, not necessarily in the area where the parking facility is built. In inner city areas within the Gürtel, there is a one-to-one requirement to remove parking spaces where additional common parking facilities are provided. While the Garagenprogram is undoubtedly well-intended, as a strategic approach it does seem somewhat at odds with the otherwise aggressive mode share targets towards sustainable travel. Taking space away from cars and dedicating it to bikes or people usually involves (political) struggles. On a more positive note, the Parkraumbewirtschaftung (Parking Management System) now has paid time limited parking both in all areas within the Gürtel (second ring road) and a substantial number of areas outside of it. Within the Gürtel parking is limited to two hours from 9am-10pm weekdays and outside the Gürtel to three hours from 9am-7pm on weekdays. There are exemptions for residents and very limited exemptions for businesses for strictly business related travel. Residents can also buy long-term parking permits for several months so that they can park in their districts. On a negative note, it’s now easier for residents to find parking lots, which makes driving a car more attractive. So, for the Parkraumbewirtschaftung to be successful in the long-term, it’s crucial to continuously remove parking lots but there’s often resistance by local district mayors/councillors against this. While there can be mixed views around parking policy, STEP 2025 does clearly stipulate that building additional road capacity is not a priority for Vienna. In fact, STEP 2025 has significant policy elements in favour of sustainable modes and becoming a city of short trips, where a great many facilities are available to residents nearby with easy access by walking, cycling or a short public transport trip. Road capacity reallocation, especially of kerbside parking, for sustainable modes and public realm improvements is part of the package but as always, stripping out parking is often easier said than done. Cycling is an area that remains a challenge for Vienna. Currently cycling mode share sits at six per cent with the aim to double this by 2015. However, this mode share is well below that achieved by many other European cities. While the current total cycle network of 1,259 km is impressive, only 21% of this has separated infrastructure, 24% are marked routes – either bike lanes, shared paths or contra-flow bike lanes on one-way streets, and 55% are signed routes on low-volume streets. 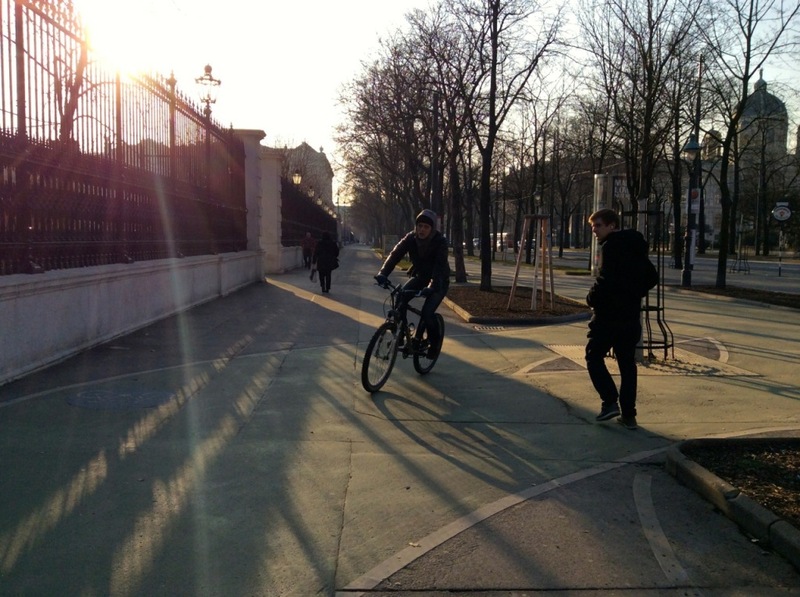 However, the City of Vienna recently announced its plans to develop cycle highways through the city that should have better infrastructure and also connect the city with adjacent areas in Niederösterreich (Lower Austria). While cycling is becoming increasingly popular, bad cycling infrastructure still hinders growth. Perceptions of cycling are that it is more challenging in Vienna, especially on or around high-traffic corridors, when compared to best practice cities in the Netherlands or Denmark. That said, there is a lot of promotion for cycling by the City of Vienna’s cycling agency Fahrrad Wien and a substantial cycling programme with 17 projects in the 2014 build programme alone, including 7 separated cycleways, 6 shared paths, 1 contraflow cycleway on a one-way street, 1 traffic calmed area, 1 pedestrian zone (where cyclists are allowed) and 1 signed route. Moreover, Vienna implemented a bikeshare system Citybike Wien in 2003 which has grown continuously in its 12 years of existence and now counts 500,000 registered users, 118 stations with 1,450 bikes and more than 750,000 annual trips amounting to more than 2.5 million kilometers. Above all, it is a very affordable system with a registration fee of only €1 and the first hour of each trip being free of charge (and reasonable rates starting at €1 per hour afterwards), therefore also being very popular with tourists. 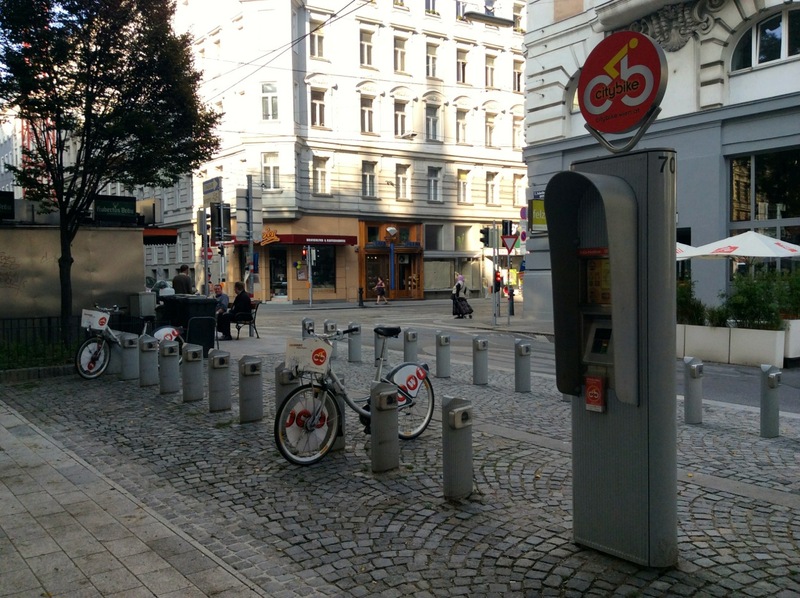 Citybike Wien was already established in 2003 and today provides an extensive network of 118 stations with 1,450 bikes. 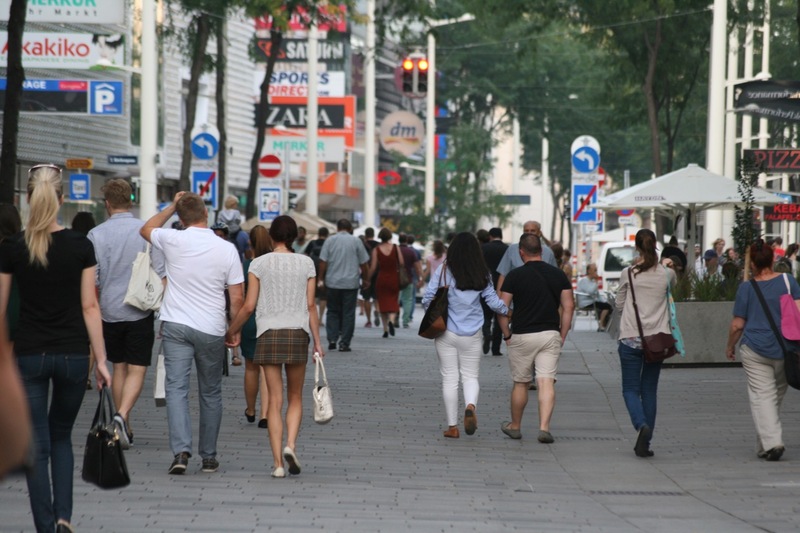 With public transit stops around every corner, compact neighbourhoods as well as many impressive sights, vibrant public places and green spaces, Vienna is a city made for walking, reflected in the city’s relatively constant mode share for walking of 28%. 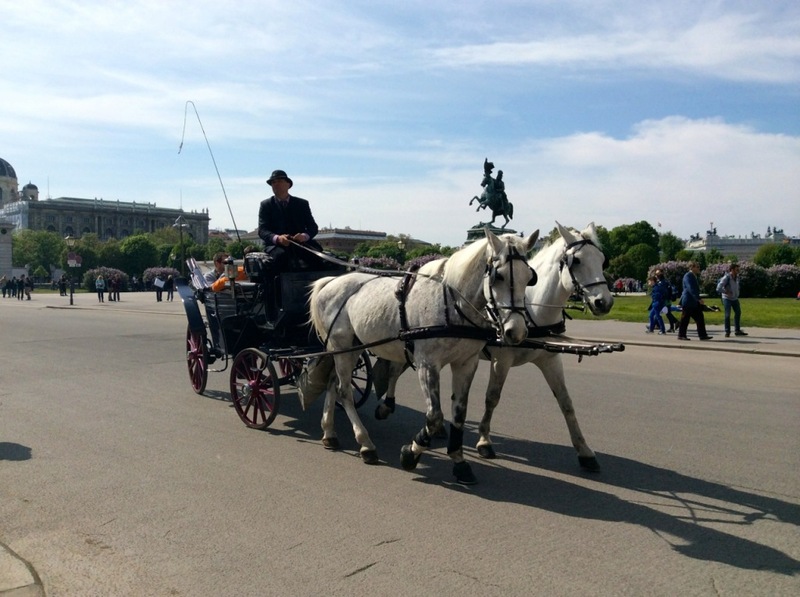 So, it is no surprise that the City of Vienna appointed a Walking Commissioner in 2013, introduced Wien zu Fuss (Vienna on Foot) as an organization for promoting walking and will dedicate 2015 to the theme of walking, including hosting the global Walk21 conference. Improving infrastructure for walking, especially increasing accessibility, and promoting walking (e.g. through walking cafés with information conversations) and its health benefits, are at the core of Wien zu Fuss’ activities. Moreover, so-called Flaniermeilen (long walking routes through the city with wider sidewalks) and a wayfinding system for pedestrians are planned. Two of these routes should be completed by 2018 with five further routes to follow by 2025. Vienna’s Inner District is one of the most walkable parts of the city, for example with pedestrian-only Kärntnerstraße leading from Vienna’s famous Opera House to St. Stephen’s Cathedral. While there may be challenges for cycling, the same cannot be said for public transit which achieves one of the highest mode shares for a city in the developed world with 39% of all trip-making on public transit. As with other modes, the sheer force of resurgent population growth, partly fuelled by strong immigration and the sheer attractiveness of Vienna’s high quality of life, is putting pressure on the system. As a result, there is a substantial investment package in expanding and upgrading the U-Bahn (subway) including a network expansion of the U2 line to the new town of Seestadt Aspern, an extension of the U1 line to the South and the construction of a new U5 subway line. 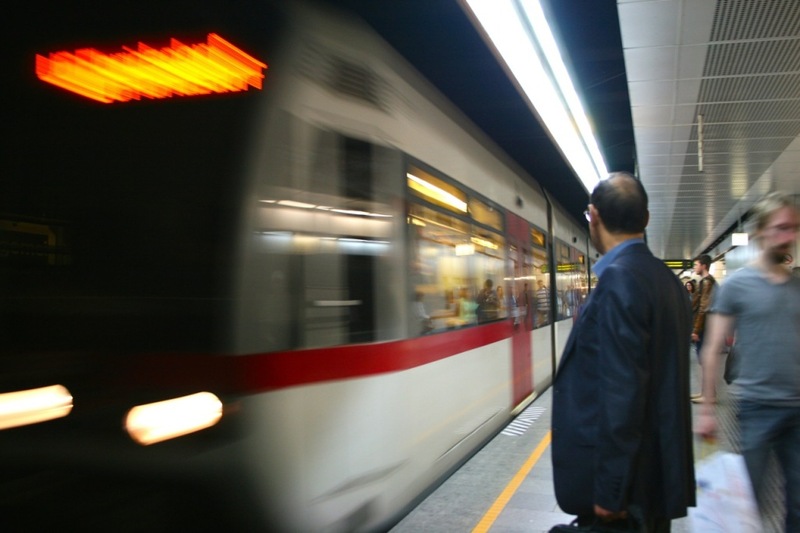 Moreover, since 2010 Vienna’s subway system operates 24-hours on weekends. 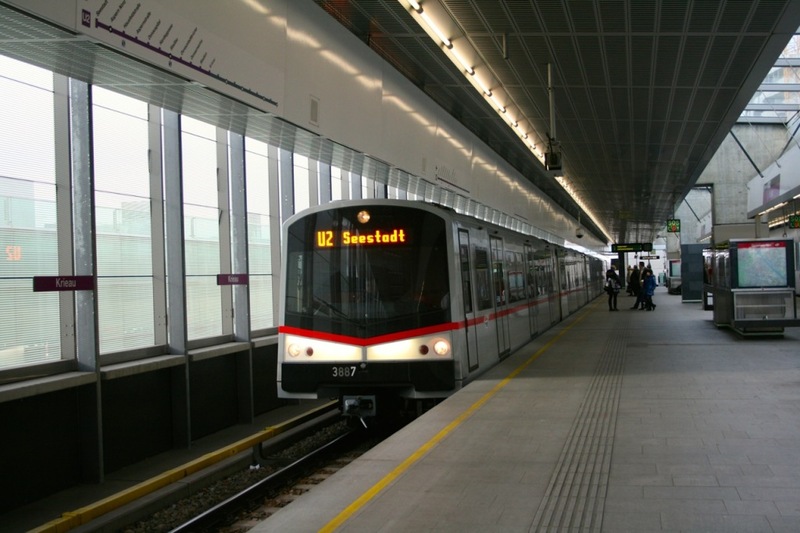 Subway line U2 was recently expanded to the new town of Seestadt Aspern. This is in addition to ongoing improvements to and extensions of the extensive tram and bus network, including the switch to e-mobility buses in Vienna’s Inner City that are fueled by electricity from renewable sources of energy. Price has played a key role in maintaining high mode share with an annual pass for the entire public transport system (subway, bus & tram) run by Wiener Linien costing just €365, or €1 per day. Since introducing the €365 annual pass in May 2012, the number of pass holders increased from 400,000 in May 2012 to 600,000 in January 2014. 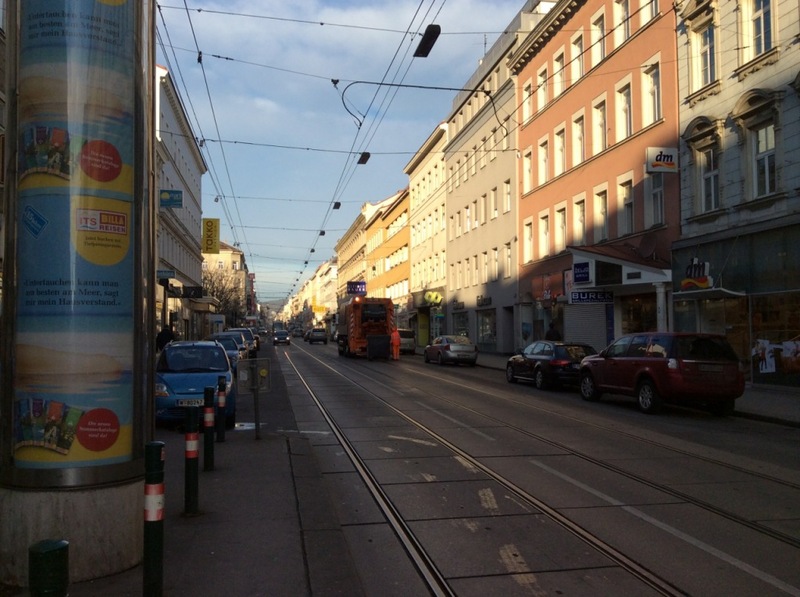 With a route length of 172 km, Vienna’s tram network is the fifth largest in the world. 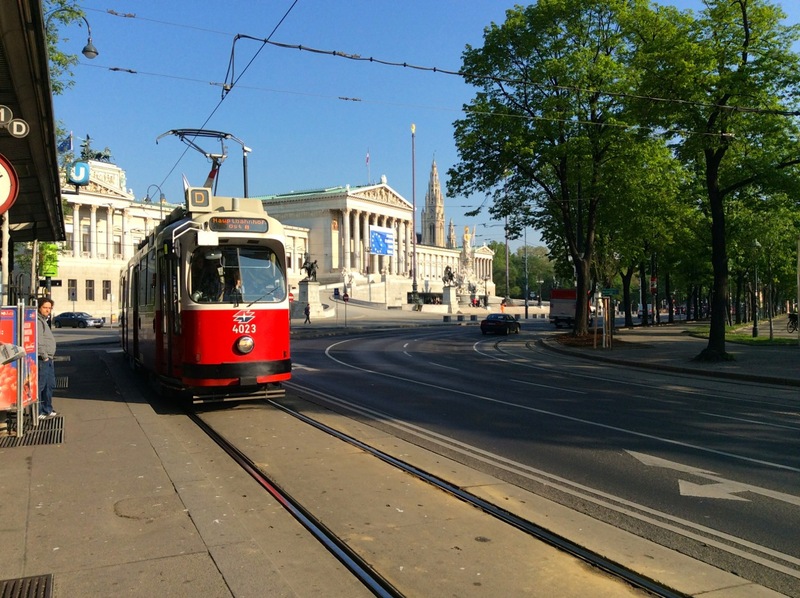 Vienna’s iconic old trams are gradually replaced by new ultra low floor (ULF) trams. 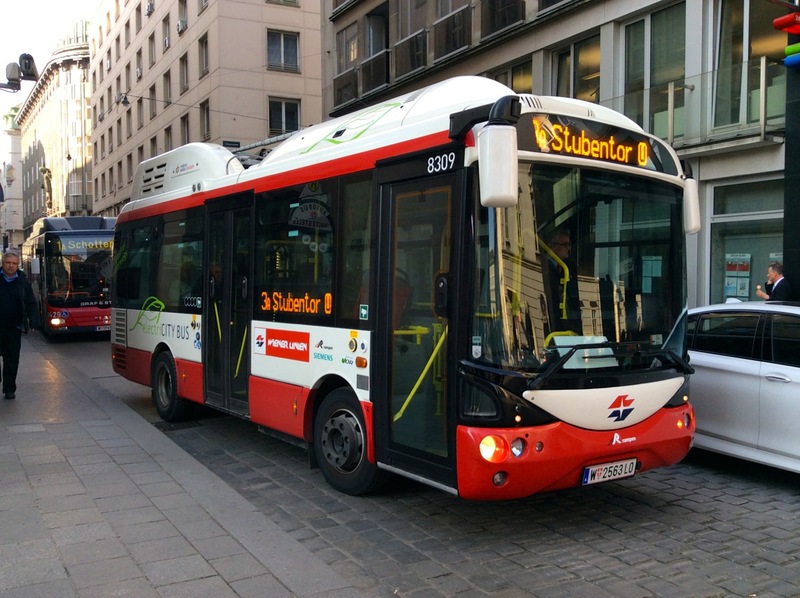 New buses in Vienna’s Inner City district are powered by renewable energy and energy efficient. And as if that is not good enough, from 2015 Vienna is introducing an upgraded version of the annual pass called the Mobilitätskarte (Mobility Card). For just an extra €12 annually, users will have discounted access to the City’s bike share system and park and ride lots, with plans to expand it to discounted car sharing, electric vehicle charging stations and so forth with the aim that all sustainable mobility is available on one mobility card. Another element that didn’t get much airplay in STEP 2025 are Vienna’s connections to the rest of Austria, Europe and the rest of the world. 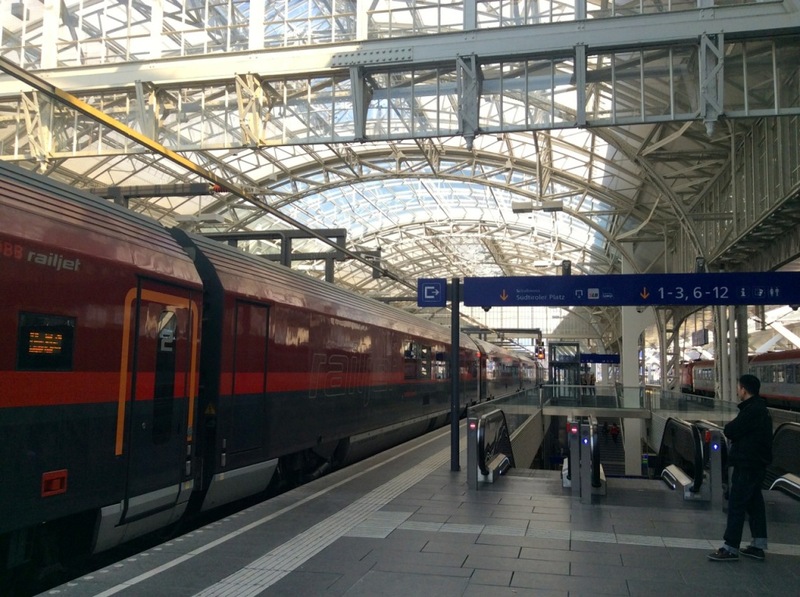 There have been key projects in this area such as the construction of Wien Hauptbahnhof (Vienna Main Station) as a through station for trains arriving from all directions (Vienna currently has different terminating train stations for trains arriving from different directions). For example, this will enable trains from the west to have a one-seat journey through Vienna continuing to Vienna Airport, enabling simpler and more connected journeys. A major upgrade to the Westbahn (Western Railway), including lengthy tunnel sections, has enabled high speed train operation by new RailJet trains reaching speeds of up to 230 km/h. A 63 km trip to the Niederösterreich (Lower Austria) capital of St. Pölten now only takes 24 minutes, while a trip to Salzburg, 290 km away, takes just 2 hours, 22 minutes. The effect of high-speed rail is to make much of Austria within day-tripping distance of Vienna. Traveling from Vienna westwards by train is now more convenient than ever before: Salzburg and its beautiful new train station is just 2:22 hours away by RailJet from Austria’s capital. 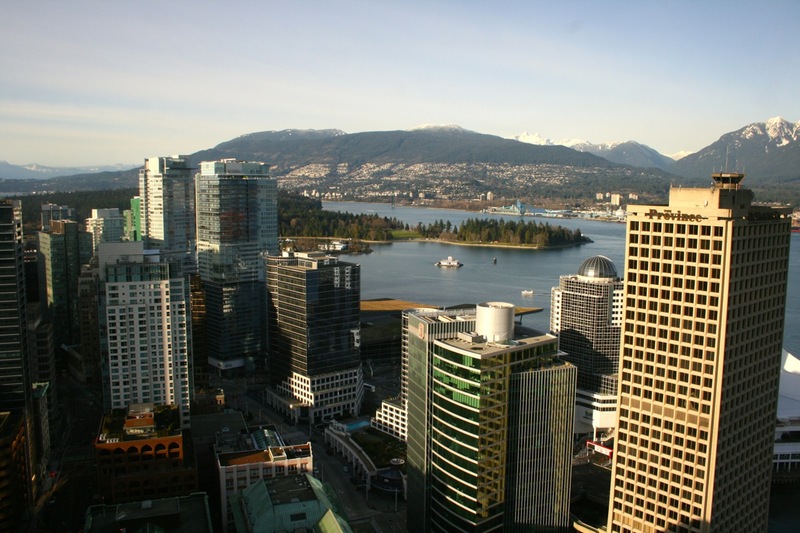 While most urban plans such as STEP 2025 naturally focus on intra-urban issues, sustainable connectivity to the wider world is a key enabler of car-free or car-light lifestyles. As elsewhere, there is an increasing focus in Vienna on integrated sustainable mobility chains rather than a focus on individual modes of transport, enabling a richer mix of blended journeys. Examples in Vienna are plans to integrate the existing bike share scheme with public transport ticketing and the use of Anrufsammeltaxis (on-call shared ride vans) to supplement the core public transport system at no extra charge to customers at periods of lower demand. The first and last leg of public transport journeys often risks being the weakest link and STEP 2025 foresees a much greater use of integrated mobility chains which can be effective at addressing first and last leg issues. If anything, this is the key takeout from STEP 2025 – the need to consider how all issues – not just transport – are connected to one another to maintain and further strengthen Vienna’s place as one of the world’s most liveable cities.